On Saturday while we were out shopping, Tracy and I decided to go to the movies. We love all things Disney and chose to see the new Cinderella movie. I think most people out there have seen the old Cinderella movie and this one stuck to the same story line with a few twists. One twist was that Ella actually met the Prince before she meets him at the ball and it is because of her that the entire kingdom is invited to the ball. One of my favorite parts was the beginning though. We spent the first part of the movie seeing Ella's childhood with her parents, seeing how happy they were together, and seeing how sad they were when her mother died. It was great seeing this as we didn't before. Before her mother dies she makes Ella promise to "have courage and be kind." I thought this was marvelous advice for anyone and Ella remains true to her promise throughout the movie. 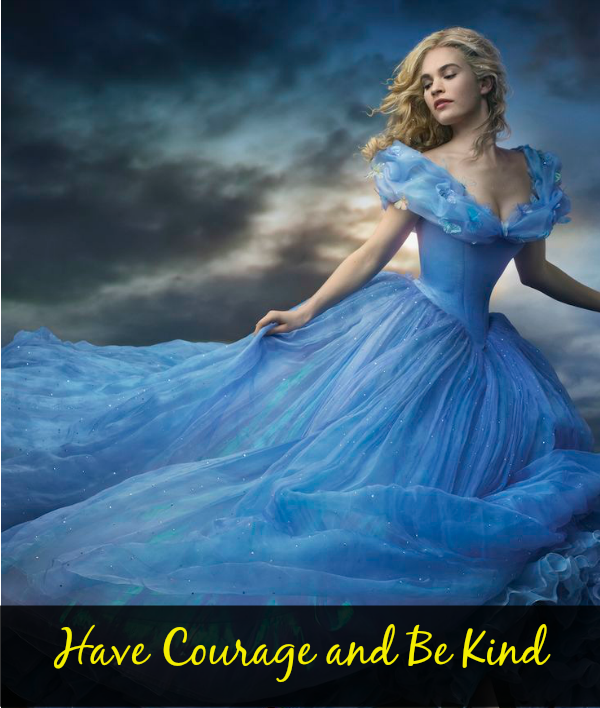 "Have courage and be kind." If everyone followed this seemingly simple advice we would have a much nicer world to live in. While this advice seems simple it is actually much harder to follow than you would first think. We all get nervous, worried, and lose confidence in ourselves from time to time making it hard to have the courage to do what we know is the right thing to do. Being kind can also be hard because some people are so cruel and mean that you just want to slap them in the face. Honestly, you never know when a kind word or action will be the highlight of someone's day. A compliment or card could be what puts a smile on someone's face and could be what brings them to pass the kindness on to someone else by them doing something for someone else later. I am going to resolve to "have courage and be kind." I am going to have the courage to try new things and to do more this year like I said I was going to do here. I am also going to remember to be kinder to everyone, even the people that get on my nerves. What do you think about this advice? I know this is so true. I love when fairytales are updated for modern times. I just love how Sleeping Beauty was updated from the "bad witch lady" point of view and the mother daughter bond. love this advice! can't wait to see the movie. and thank you both again for the card. This movie does not hit AU cinemas until 26th, but I'm definitely planning to see it!